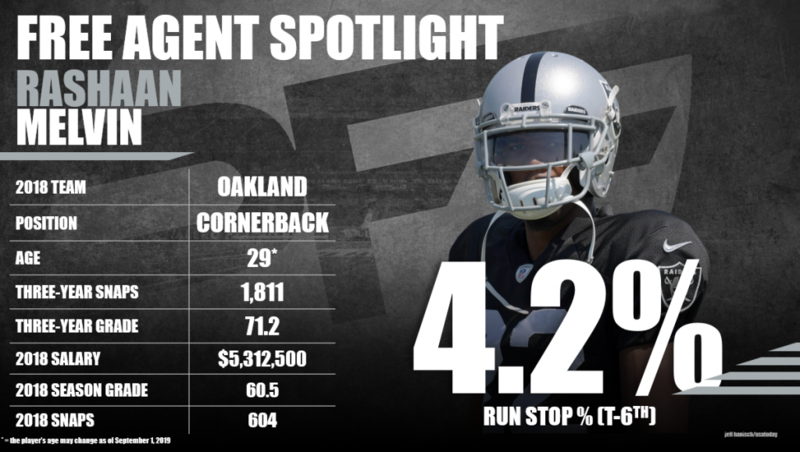 Rashaan Melvin’s one-year stint with the Oakland Raiders didn’t go as planned. Coming off a career year in 2017, Melvin signed with Oakland but never lived up to the hype, earning a 60.5 overall grade across his 604 defensive snaps in 2018. Melvin could return to his 2017 form if given the opportunity with a change of scenery, but he likely won’t see the same level of contract he saw last offseason with his 2018 season being as bad as it was with the Raiders. Subscribe to Pro Football Focus’ ELITE subscription to research Rashaan Melvin’s grades, advanced stats, snaps and more in Premium Stats 2.0.